Late afternoon a faint twinge of discomfit was felt. So I had a cursory look around the place and then dismissed my concern. They'll emerge at tea time. Teatime came and went and the babies were still absent. Soon it would be dusk, and then dark. Daisy was by this time prowling around, more angry than fretful, searching for the recalcitrant two. Back inside for the commencement of a second going over and suddenly, there's Jeffrey in the hallway, flicking his wee tail in disdain it would seem. Soon after Palangi appears out of nowhere. Of course in our relief we didn't do a post mortem and spend ages trying to figure out from whenst they had magically arrived. Until this morning. Breakfast disposed of, again, they disappear. Now last night we noticed their miraculous manifestation occurred in the vicinity of the study. So we figured that the computers and necessary tangles of wires were providing a hidey hole. So we pursued that line of enquiry, to no avail. Then I said, "Could they be in ---," but David assured me they could not. The back is solid. Which is true. Martin Wells, a statistician at Cornell University, re-ran the statistical test to check whether regional variations in IQ -- which is lower in Latin America and Africa -- could account for the IQ differences Prof. Straus found. After accounting for regional variations, Dr. Wells found the effect of spanking vanished. Dr. Wells plans to use the Prof. Straus's research in the classroom to demonstrate why it is important to consider alternative explanations. Where or what would you cut? Thinking about the previous post, this government needs some ideas about how to cut spending. Can we assist? Substantial amounts are needed so bear that in mind, and make sure you can cost it (roughly). Don't go all radical libertarian on me. Be realistic (yes, I know radical libertarian is realistic, but we live in an unreal world) and let's see how big a total we can build. We had a hefty ACC rise last year under Labour. Now we have an even heftier ACC rise under National. I still haven't figured out what improved with the change in government. This is an interesting interview from the Wall St Journal, more because it encapsulates why the drug war won't go away rather than why it should. In the past I have examined the gender imbalance in working age Work and Income clientèle. 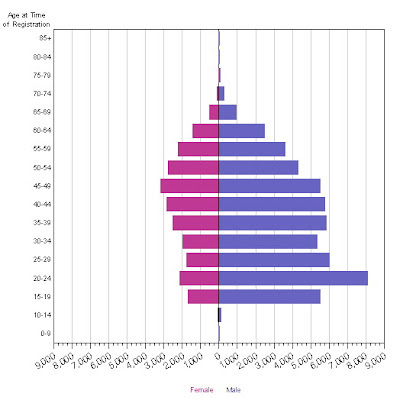 The ratio was running about 60:40 weighted towards females but has dropped back slightly with more unemployment. So in the interests of fairness I should point out that males make far more ACC claims than females (and pay more in premiums). 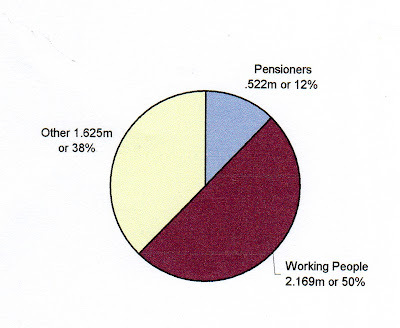 This is the number of all active entitlement claims in the 2008 financial year. Females cost $602,323,000 and males $1,343,388,000. The cost of female claims in weekly compensation is $247,194,000 and male, $650,978,000. There is one area where females claims are much higher. Sensitive claims (usually by victims of sexual crime) cost $15,965,000 for females and $3,709,000 for males. Obviously men work in more dangerous jobs as reflected in work related claims (female) $123,991,000 and (male) $458,799,000. In sports the male dominance continues at $68,746,000 for females vs $212,956,000 for males. Even with home and gradual onset claims, men are more expensive. And you can imagine who have most of the bad backs and motor vehicle accidents. There is no gender breakdown for serious injuries caused by fighting(!) but I am picking they would also be dominated by males. They cost only $874,000. A snip. Shadow Chancellor George Osborne has outlined plans to raise the state pension age for men to 66 from 2016, up to 10 years earlier than planned. He said the move was needed to help reduce the UK's debts, saying "hard choices could not be avoided" because of the dire state of public finances. Under the government's existing plans, the state pension age for men will rise gradually from 65 to 68 between 2024 to 2046. 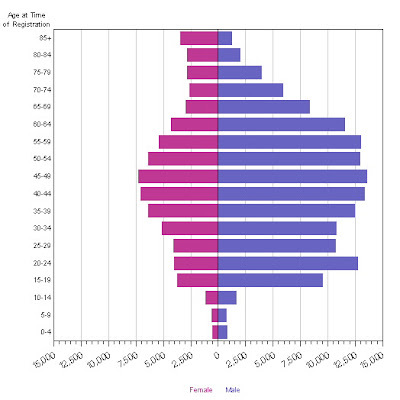 For women it will gradually rise from 60 to 65 over ten years from 2010. Why are UK women allowed to qualify 5 years before men??? Now if NZ women qualified for Super at 60 that would add up to another 120,000 pensioners or push the total up to nearly 15% of the population. What is wrong with the poms? I always thought their sheila's were soft. Seriously, I cannot think of any reason why women are paid a state pension to retire at 60, when men are not. 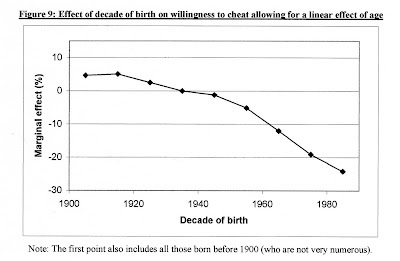 The following graphs are from a recent study by the London School of Economics which charted the change in values by examining waves of survey questions put to people born in different decades. The paper theorises that the work ethic has been 'wrecked' by benefits, as Mail Online puts it. Abstract: Jean-Baptiste Michau argues that a declining work ethic helps to account for raising European unemployment from the 1970s. He defined work ethic by a belief that work came first and honesty. One question asked was, is it OK to claim benefits you are not entitled to? The base point is 1930. Beyond that shows the likelihood of change in the answer given. 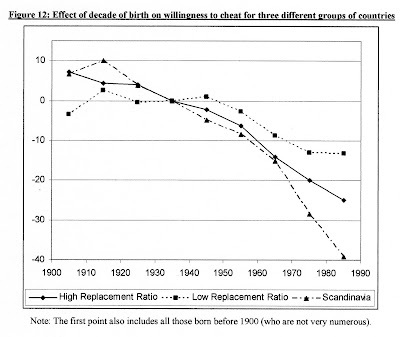 So someone born in 1980 was 24 percent more likely to justify cheating. Then he looked at how high unemployment benefits/insurance payments were and if it affected the change in values. Is there anything that would indicate NZ would show a similar result? 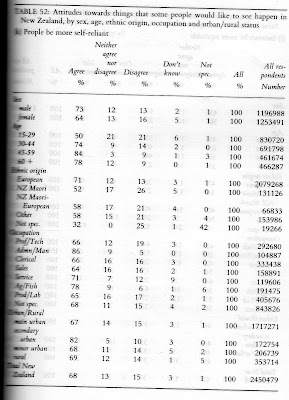 The 1988 Royal Commission on Social Policy did exhaustive surveying on values and one of the questions asked was, people should have to look after themselves more with less help from the government - do you agree, disagree, etc. That is a different question but relevant, perhaps. The result shows that the older people were the more likely they are to agree, with a spike for those born during the depression/ WW11. But because this is just one survey (as opposed to waves) it is impossible to control for age, which the above graph has. In 2008 the Inland Revenue Department transferred $136 million from collected child support payments to the consolidated fund. This money offsets what is paid to custodial parents on benefits. Welfare commentator Lindsay Mitchell says this is a small percentage of what custodial parents are costing the state. "In 2008, the basic DPB bill was $ 1.479 billion. However, when other top-ups like the accommodation allowance are added, the all-up bill exceeds $2 billion. The transfer from IRD represents 6.8 percent of the total." "Forty five percent of liable parents (58,423) have annual incomes below $20,000 and pay only the minimum rate of $2.19 per day per child. During April this year 35,675 liable parents, usually fathers, paid child support from their own benefit income." "DPB claimants are required by law to file a child support application or face a penalty for not doing so. At June 2009 no application had been filed for 19,400 children included in a sole parent benefit." Reading the following from today's NZ Herald one could be forgiven for thinking that we have come a long way. Numbers on the unemployment benefit declined from a postwar peak of 177,000 in 1993 to 17,710 in June last year, but rose almost four-fold since then as the world plunged into recession. Unemployment only a tenth of what it had been. Marvellous. In 1993 there were 63,700 people on sickness and invalid benefits. Add that to unemployment and you get 240,700. Today add the 140,800 on sickness and invalid to the 60,660 on unemployment and you get 201,460. Let's chuck the DPB in as well, 96,300 in 1993 compared to 106,600 now to get new totals of 337,000 in 1993 and 308,060 in 2009. Just an alternative look at some numbers. On the plus side one could argue that the picture is still much better because the population has risen by 25 percent since 1993. True. One could also argue that the higher numbers on benefits other than unemployment mean total dependency is worse. How's that? If we measured dependency in weeks (Sweden manages to) rather than at a point in time, today's statistics are almost certainly worse. That is because people spend much longer on invalid, sickness and domestic purposes benefits. That explains, in part, why the social security bill (now nearing $20 billion) continued to rise while numbers on the unemployment benefit dropped drastically. As you can see the stays on unemployment benefit are much, much shorter, as you would expect. In the early 1990s stays were comparable with 79 percent of recipients reliant for less than 1 year and 94 percent reliant for less than 2 years. There are people on invalid's benefit with medical conditions that make it impossible for them to work. But there is growing acknowledgement that sickness and invalid benefits (called disability support pension in Australia and incapacity benefit in the UK) are de facto doles. Many gravitated to them over the past ten to fifteen years because of the physical and mental impacts of being long-term unemployed. So make your own mind up. Have we come a long way since 1993? And have another quick look at the link. Should the Minister of Social Development really be looking so jolly? Doing a little market research here. What percentage of the welfare bill for sole parents do you think liable parents are footing?